Think You Know What 'Queer' Looks Like? Think Again. 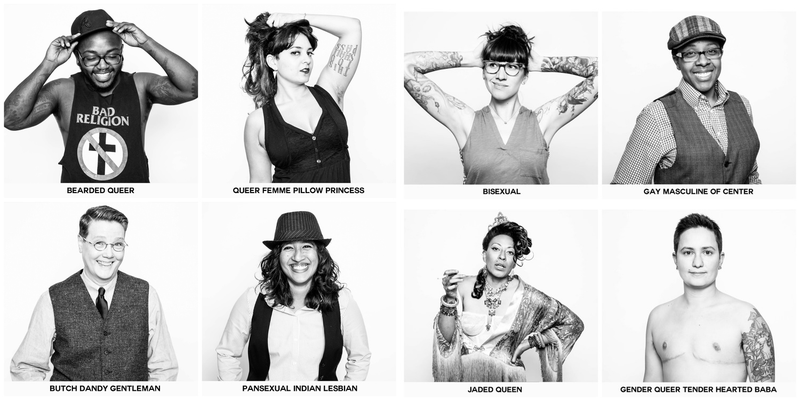 What do queer people look like? What does it mean to be LGBT+ when it comes to outward sexual orientation markers and gender presentation? The Identity Project seeks to answer this question through a collection of portraits of people who identify across the LGBT+ spectrum. The results are spectacular and thought provoking, possibly even controversial. How did the whole thing get started? In January 2014, Sarah Deragon posted a photo her wife had taken of her on Facebook with the words, "Queer Femme," and The Identity Project was born. This photography project was launched because as a photographer, Sarah wanted to explore the labels that we use when we define our sexuality and gender. I am firmly in the "labels are important and serve to bring people with similar marginalised experiences together" camp, although I know plenty of people within the queer community both in the West and in Japan who balk at labels. "Why do we even need labels," they ask, "can't we just get rid of all of the labels? We'll be ever so much better off!" Well, I think that would be true if all identities and the expression of those identities were treated as equal. Then the unifying aspect of labels for marginalised identities would't be necessary. However, that equality doesn't exist, marginalisation does occur, and there is strength and unity in labels. Even in sub labels! Sarah believes that The Identity Project resonates with people because the photo project pushes up against the preconceived notions of what it is to be LGBTQ in today's society. Not only are the portraits striking, the participants in the project are playing with language, making up entirely new terms (transgenderqueer or inbetweener) and showing pride in their complex and ever changing identities. Labels and sub labels are useful for expressing aspects of one's identity, and they can be really important. What's my identity? I label myself, if the conversation requires it (such as now) as a tomboy femme lesbian transgender woman. What does that even mean? Well, my gender is woman, and it's a gender identity which is in opposition to my assignment at birth, I'm sexually and romantically interested in other women, and while feminine of center, I'm a mix of sporty/preppy/outdoorsy which is distinct from other types of femininities of center (such as low femme or high femme, 'lipstick lesbian,' etc). This may seem silly to some, even to many, but it helps me to orient myself mentally. It also serves as my response to the, "if you're going to claim to be a woman, act like a woman!" comments I sometimes receive. Tomboy femmes need not be lesbians. Women need not be high femmes. My gender identity does not preclude me from having personal issues with frill and lace, or a preference for boat shoes over high heels or LL Bean duck boots over ballet slippers. I've enjoyed looking over Deragon's work, because I understand how important self identification can be. Categorisation is not the enemy... As long as we are in control of our own categorisation. More at The Identity Project website. Images via Sarah Deragon. Used with permission.